Typically, to install a Locking Drop Boxes with Pedestal, you will first need to create a concrete pad below frost line of at least 4 feet square, 6" depth minimum with approximately 6" of gravel for drainage, per unit. Also, try to ensure that the top of the footing is slopped to further promote run off. Once concrete has cured you will then install four leveling nuts onto the anchor bolts, set the Pedestal onto the base plate and adjust the nuts and washers to secure tightly. Then, you will install the Locking Drop Box onto the platform by aligning the bolts onto the holes and securing the unit tightly to the base with washers and nuts. 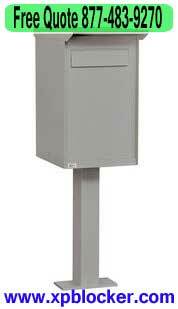 Your unit should be virtually maintenance free and secure. This installation procedure should be applicable for all sizes that XPB Locker & Supply offer. 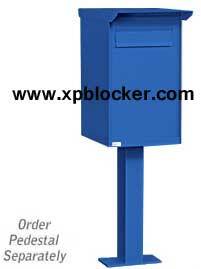 There are three sizes of Locking Drop Boxes with Pedestal that we offer at XPB Locker & Supply. The regular size comes in 15.75"W x 27"H x 19" D, the Large 23"W x 27"H x 19"D and the Jumbo 30.25"W x 27"H x 19" D. The color options are Blue, Gray, White, and Primer or for an additional charge a custom color. These units have a hood that offers weather protection and a front mail flap, two points of access through the rear master doors with a "T" handle lock that swing a full 90 degrees, and are made entirely from Aluminum. They are also powder coated to create a lasting, hard finish that will stand up to the elements. 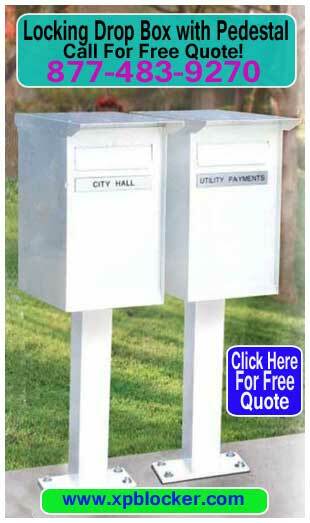 The Locking Drop Box comes with or without an aluminum, matching powder coated pedestal which measurements are 4"W x 28.5"H x 5.5"D.
There are also several different configurations with these units. Including; rear access, front access, slot, no slot, solid rear, two door slots, two front doors, four front doors, custom slots and any variations of the listed. Contact one of our professional sales associates to assist you in finding just the right configuration of a Locking Drop Box with Pedestal that will fit your application, perfectly. XPB Locker and Supply offers a wide array of different types of aluminum or steel bleachers, industrial warehouse equipment, commercial signage, gates, mail boxes for residential or commercial applications, commercial outdoor furniture, bike racks, industrial lavatories and sinks, storage units and lockers. This article was published on Monday 10 March, 2014.